The Shree Yantra - is one of the the most powerful and sacred symbol used in India in Astrology and Vastu Shastra since hundreds of years. "Shree" – means Wealth and "Yantra" Means Instrument. A Yantra is a symbolic representation of aspects of spirituality. 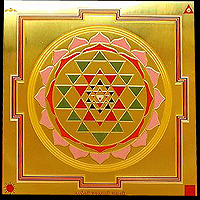 A Yantra is A mystical diagram done on a Metal Plate. It is an interlocking matrix of geometric figures, typically circles, triangles and patterns that form fractal patterns of great elegance and beauty. Used for thousands of years, these transformational devices hold cosmic energy and transmit powerful frequencies that enliven our lives on every level of existence. Thus Shree yantra Can also be termed as the instrument to Attract Wealth. In Vastu Shastra we believe that the Shree Yantra is known to usher in great amount of positive Energy, prosperity and good luck. In the past our Kings and moguls were fully aware of the miraculous power of the Shree yantra and they used it to its optimum potential, Thus in the olden days India was considered as a Golden Pigeon because of the Tremendous amount of prosperity it Enjoyed. We are surrounded by Energy, Energy which can be positive or negative. Many times we feel that, In spite of doing a lot of hard work, we are Not being able to achieve Success. Many persons come to me saying that In spite of doing every thing Possible for their families, they are constantly feel ALIENATED or Left Out. One Reason that I can Understand is that persons who are constantly suffering, are living in an Environment, which is filled with BAD energy thus not allowing them to realize or achieve their Dreams or Live Harmoniously in the Family. It has been observed that when ever you Visit any temple or Places of Worship, You find peace and a sense of positive energy. 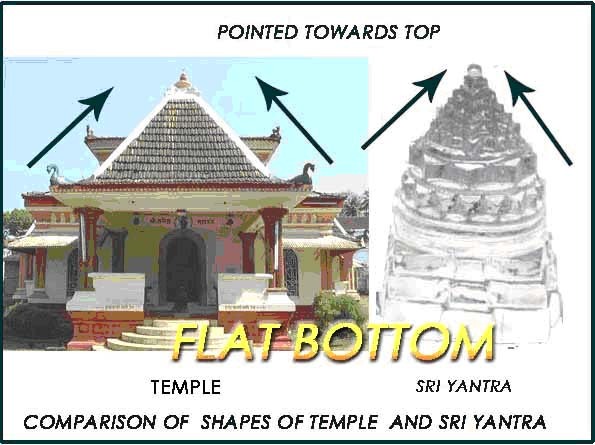 The reasons behind them is that Most of the Places of Worship are designed as per VASTU and You will be Amazed to observe that the design of any Temple or place of Worship is Almost in the form of Shree Yantra i.e Flatted and Broad in the BOTTOM and Pointed Towards the TOP..
Sri Yantra is the source of powerful supreme energy it is designed in the shape of waves and rays. Shree Yantra is highly sensitive and has magnificent magnetic powers. Shree yantra is said to be a divine store-house of energy which pick up particular cosmic ray wave emitted by the planets and other universal objects and transform them into constructive vibrations. Sri yantras Come in 2 Dimensional and 3 Dimensional types. "Sri-Yantra" is also considered as a Yantra of Goddess Laxmi. The Godess of fortune, Thus it is also said that Fortune Shines on the person worshiping the "Sri-Yantra". Flat or 2-Dimensional "Sri-Mantra's are Most Auspicious in Copper Metal because Copper is Powerful conductor of Energy thus they give the best Results in Copper. 3-Dimensional "Sri-Yantra's" are Best when they are in Quartz Crystals, because Crystals are Natural products and have inbuilt energy and positive vibrations are Enhanced and the results are fast and better. Nowadays there are Excellent Spatic Shree yantras also available which are concidered very powerfull. Thus we can conclude by saying that Every person irrespective of their caste and creed can very well Enhance the Quality of their lives with the Help of “Sri-Yantra's". So please go ahead and Enjoy Prosperity and worldly Bliss with the power of "Sri-Yantra's". Anyone who wishes to buy an authentic "Sri-Yantra's" can contact me and also for certain Secret mantras and Procedures to Enhance the Power of "Sree-Yantra's". In Astrology and Vastu Shastra, there are immense amount of Benefits associated with Shree Yantra and the use of Shree Yantra as follows. Sri yantras Come in 2 Dimensional and 3 Dimensional types. "Sri-Yantra" is also considered as a Yantra of Goddess Laxmi. The Godess of fortune, Thus it is also said that Fortune Shines on the person worshiping the "Sri-Yantra". Flat or 2-Dimensional "Sri-Mantra's are Most Auspicious in Copper Metal because Copper is Powerful conductor of Energy thus they give the best Results in Copper. Shree Yantra helps in achieving Name fame and fortune, wealth and overall prosperity in a persons life. Shree Yantra brings name, fame and good luck at Home in the Office or Factory wherever it is kept. A Person who prays to the Shree Yantra is positively charged and finds the True Purpose of his life. Anyone praying to the Shree Yantra gets gives mental peace and stability. A Person who prays to the Shree Yantra grows in terms of the spirituality his miind becomes pure and attains a Positive state of mind. GET AN EXCELLENT QUALITY SHREE YANTRA WHICH IS POSITIVELY CHARGED AND PREPARED IN ACCORDANCE WITH VEDIC RULES AND PROPER POOJA AND PRAN PRATISHTA DONE. FOR MORE DETAILS CALL ON 9819015736 / 9324012326 (Mumbai).